Animal species and diet – All animals will utilize nitrogen (N), phosphorus (P), and potassium (K) from the food they eat in different ways. On average, 70 to 80 percent of the N, 60 to 85 percent of the P, and 80 to 90 percent of the K that the animal eats will end up in its manure. These values shift depending on species; for example, swine and poultry tend to excrete more N, P, and K per 1,000 pounds of live animal weight than cattle on a yearly basis. Bedding – The material used could affect the nutrient content and availability. Plant-based bedding has nutrients, too! Storage and handling – Is the manure stockpiled? Kept in an uncovered lagoon where rain water could dilute the nutrients? Do you use anaerobic digestion? Do you mix the manure often? All of these things will affect the nutrient content. Method of field application – Broadcasting the manure on the surface of the soil without incorporation leads to a higher risk for N loss as ammonia. By incorporating the manure, you can conserve more N, depending on timing. Weather and soil conditions – Plants can only take up inorganic forms of N, P, and K. Some of the nutrients in manure are in the organic form, meaning that they are bound to carbon. Soil microbes have to break the carbon bond to make the nutrients available for the plants – a process called mineralization. This means that good soil conditions for the microbes are essential. Cool temperatures and soil that is too moist or too dry can slow mineralization down. For solid manures in a stockpile, make sure to take many subsamples (about a cup each) from different depths and different heights in the pile, but avoid the surface crust. Put all subsamples in a bucket (a 5-gallon will do) and mix thoroughly. When you think you are done mixing, mix it some more! Then take a subsample from the bucket to send to the lab, following the lab’s directions as appropriate. For liquid manures in a lagoon or pit, you will need to wait until it is has been thoroughly agitated. Remember to NEVER enter a confined manure storage area – safety is key! Take several subsamples as it is being pumped, preferably at several different times as the pit or lagoon is being emptied. Again, mix the subsamples in a bucket thoroughly. Once that is finished, take a subsample from the bucket to send to the lab, and prepare according to the lab’s instructions. I suggest doing this yearly until you have received consistent results several years in a row. Then, continue collecting samples every 3 to 4 years or whenever you have a change in animal numbers, diet, bedding, housing, or storage practices. Once you get the results back from the lab, you’ll want to calculate the application rate from the expected nutrient availability. For P and K, you can assume approximately 80 percent of the total P and 90 percent of the total K is available the first year of application. Nitrogen is a bit more complicated since you will need to know the application method and animal species. See the MPCA’s Manure Application Rate Guide for help with calculating the application rate for N.
One word of caution: If you apply enough manure to have the full rate of N, the manure tends to have more P than you really need. Over time, P can build up in the soils and once the levels are high enough, you may be subject to regulations by the state. Avoid the buildup of P to excessive levels! To understand more about MN regulations regarding manure, click here. Manure and nutrients have a complicated relationship. 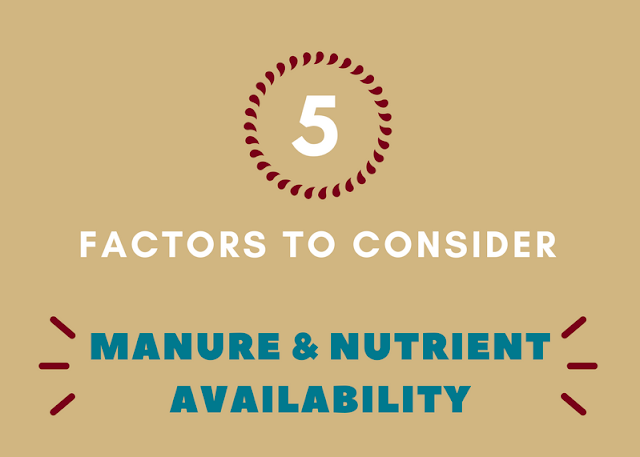 While it may seem easier to just use commercial fertilizers, remember that manure has more than just N, P, and K. The added value comes from secondary nutrients and micronutrients. Plus, research has shown that manure tends to increase soil health. Managing manure properly is the key for healthy crops and a healthy environment.